Sydney L. Moss Ltd., 2003. Songhua stone is classified as an argillite, and is a member of the sedimentary rock family. It became highly valued during the late 17th century as a direct result of the Kangxi Emperor's fondness for the material. With its unique and attractive green striations and renowned ink-grinding quality the stone became a staple of the Palace carvers. 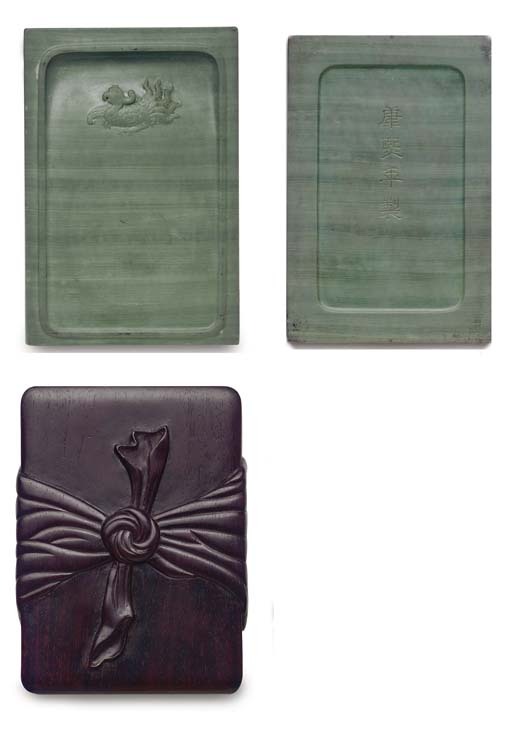 Production of Songhua inkstones continued through the Yongzheng period and well into the Qianlong, although on a smaller scale compared to that achieved during the reign of Kangxi. For a survey of a portion of the Imperial Collection of Songhua inkstones, see A Special Exhibition of Songhua Inkstone: Comparable to the Best Tuan and She Inkstones, National Palace Museum, Taiwan, 1993, where an inkstone with a similar fenghuang in the inkwell is illustrated p. 94, no. 23. Another related example of similar form bearing a four-character Kangxi mark in a line within a recessed base, but carved with a cluster of clouds in the inkwell, also with a similar fitted wood box carved with a knotted sash is illustrated ibid., p. 111, no. 32.